More than 1,500 temporary McGill University workers have declared a five-day strike, demanding more money and equal treatment with permanent employees. The workers picketed on Sunday as the university held an open house, saying little progress has been made in efforts to negotiate a new contract. “It makes me feel really frustrated and like my labour isn’t worth anything to McGill,” said Lucie Lastinger, who is also a student at the school. Inori Roy, another casual employee, said timing the protest with the open house, where thousands of prospective students and parents visited the campus, was intentional. The union has been without a contract since April, 2015. According to the union, 85 per cent of its members are also students. Equal treatment, including hiring priority for those with relevant experience. Stable jobs, including seniority and benefits. A $15 minimum wage plus regular pay increases. A better job posting system and more student input into work study jobs. Union President Claire Michela said the current lowest wage of $10.85 not enough to survive on. There has been a larger push in Quebec for a province-wide minimum wage of $15 and casual employee Parker Finley said that is what is required for a living wage. In an email, a McGill spokesperson said negotiations aren’t over and the university is set to return to the bargaining table on Nov. 10. 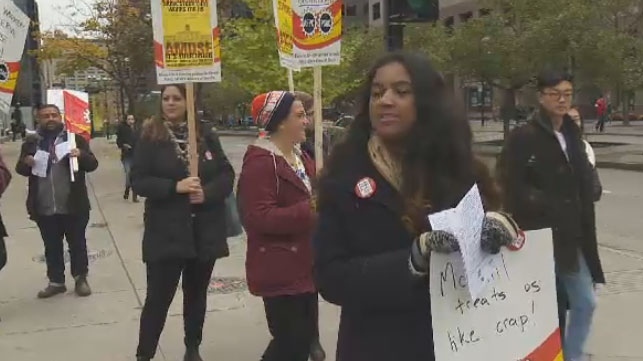 McGill University's casual employees, 85 per cent of which are students, has been without a contract since April, 2015.